The prostate never stops growing, so it’s common for a man to have issues relating to it when it becomes enlarged. This is often referred to as BPH or Benign Prostatic Hyperplasia. In fact, about half of all men between the ages of 51 and 60 have BPH. Up to 90% of men over age 80 have BPH. 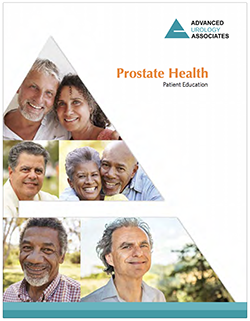 This International Prostate Symptoms Score (IPSS) can help you determine how badly your BPH symptoms are affecting your quality of life and help you find an easy way to get back to the old you. Incomplete emptying - How often have you had the sensation of not emptying your bladder completely after you finished urinating? Frequency - How often have you had to urinate again less than two hours after you finished urinating? Intermittency -How often have you found you stopped and started again several times when you urinated? Urgency - How often have you found it difficult to postpone urination? Weak Stream - How often have you had a weak urinary stream? Straining - How often have you had to push or strain to begin urination? Sleeping - How many times did you most typically get up to urinate from the time you went to bed at night until the time you got up in the morning? Regardless of the score, if your symptoms are bothersome, contact us and we can help. Questions About Your BPH Symptoms or How Easily They Can be Treated? give us a call at 815-409-4730. We are happy to schedule an appointment and take the time to discretely answer all the questions and concerns you may have.